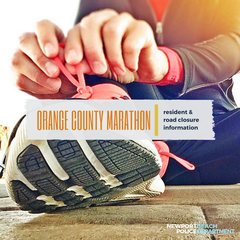 The Newport Beach Police Department is advising that the Orange County Marathon will be held on Sunday, May 6, 2018. Road closures and delays will begin at 5:00 a.m. throughout Newport Beach, lasting in some areas through 12:00 p.m. Please take a moment to review the road closure information below. The areas around Corona Del Mar will be heavily impacted on May 6, 2018 from 5:00 a.m. to 8:00 a.m. Anyone needing to leave the area during these times is advised to leave before 5:00 a.m. If leaving after 5:00 a.m., residents are advised to park east of Orchid Ave. and take East Coast Highway west to MacArthur Blvd. and then north to the 73 Freeway. • Eastbound traffic on East Coast Highway will be closed from Avocado Ave. to Orchid Ave. from 5:00 a.m. to approximately 8:00 a.m.
• Residents who live near China Cove are advised to park north of Bayside Dr. between Carnation Ave. and Fernleaf Ave. You may exit the area by driving west on Second St. to Avocado, north to East Coast Highway, and west on East Coast Highway to Jamboree Rd. These areas will be heavily impacted on May 6, 2018 from 5:00 a.m. to 8:45 a.m.
• Eastbound traffic on East Coast Highway will be closed from Avocado Ave. to Orchid Ave. from 5:00 a.m.to 8:00 a.m.
• Bayside Dr. from Marguerite Ave. to East Coast Highway will be closed from 5:00 a.m. to 8:45 a.m.
• The Balboa Island Bridge (Jamboree Rd. and Bayside Dr.) will be closed from 5:00 a.m. to 7:45 a.m. Residents on Balboa Island returning or leaving the island during these hours will have access through the Balboa Island Ferry. These areas will be impacted on May 6, 2018 from 5:00 a.m. to 10:30 a.m.
• Northbound Dover Dr. from East Coast Highway and 16th St. / Castaways Ln. will be closed from 5:00 a.m. to 9:00 a.m.
• Westcliff Dr. from Dover Dr. to Santiago Dr. will be closed from 5:00 a.m. to 9:30 a.m.
• Santiago Dr. from Westcliff Dr. to Galaxy Dr. will be closed from 5:00 a.m. to 9:30 a.m.
• Galaxy Dr. from Santiago Dr. (south) to Santiago Dr. (north) will be closed from 5:00 a.m. to 9:45 a.m.
• Santiago Dr. from Galaxy Dr. to Irvine Ave. will be closed from 5:00 a.m. to 9:45 a.m.
• Northbound Irvine Ave. from Santiago Dr. to University Dr. will be closed from 5:00 a.m. to 10:30 a.m.
• All residents that live east of Santiago Dr. and need to leave between 5:00 a.m. and 9:45 a.m. are advised to park west of Santiago Dr.